Masa finds life in a bordello unsettling. 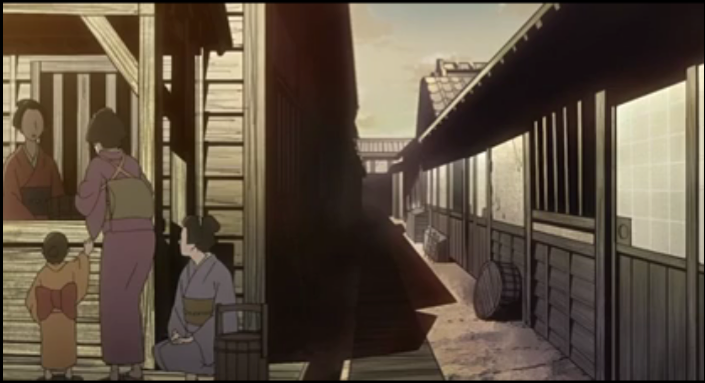 In episode 4 of Saraiya Goyou: House of Five Leaves Masa attempts to unveil Yaichi’s character, and in so doing irks his patron. The show continues to be a sort of visual poetry, not sumptuous, as a feast, but carefully selected and arranged to display what is minimally necessary for the character study that is at the heart of this series. 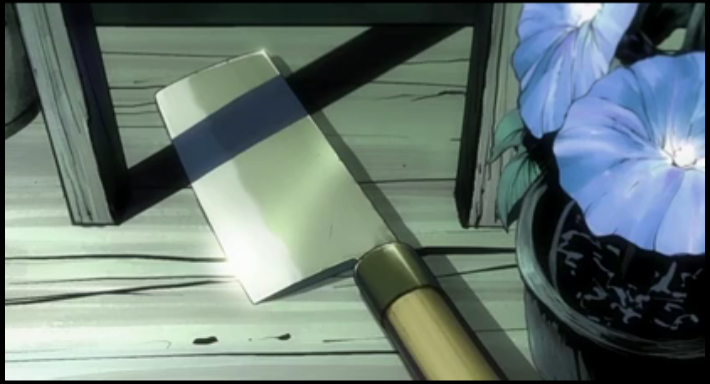 Ume keeps his cleaver very sharp. 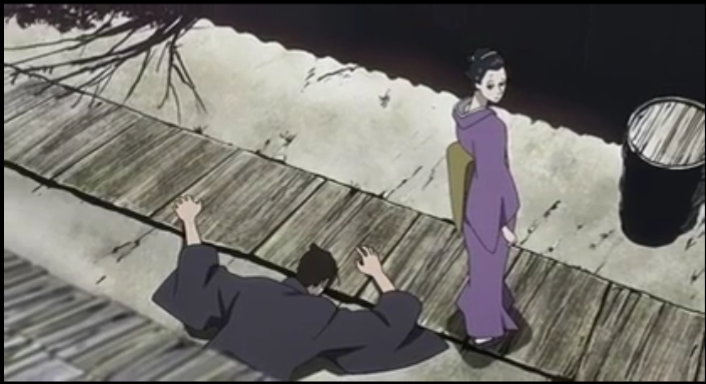 The episode is revealing of Yaichi’s past, in that flashbacks show important moments in the development of the Five Leaves gang, including his proposal of the first kidnapping, and the circumstances under which Yaichi met Matsu. I felt sorry for the two cops who come upon Yaichi in that sequence; they are trying to do their jobs and Yaichi sure knows how to complicate things for them. What a beautiful place to hold a kidnap victim. 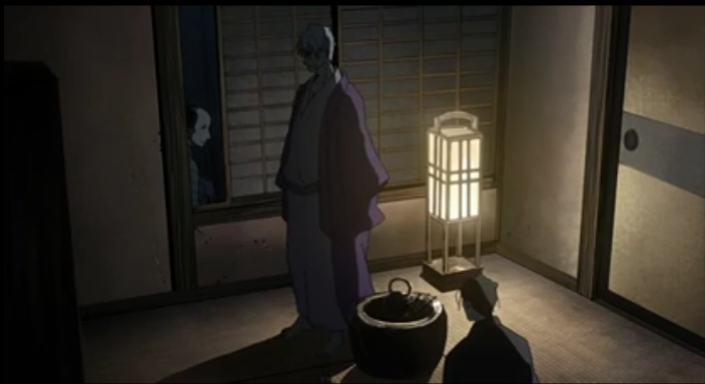 As I suspected, Masa has some lingering concerns about the boy they kidnapped. Yaichi seems to understand this, and explains better his reasoning, but Masa keeps harping on it to the point that Yaichi shuts him up by calling him boring. This episode gradually shows that Masa is having difficulty walking. Yaichi diagnoses the cause as “Edo disease” (beriberi, a vitamin B deficiency, caused by not eating enough soba, according to this site). 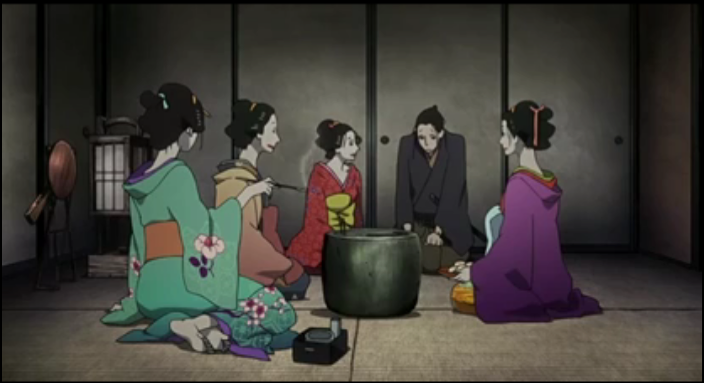 Masa seems out of place in a brothel. I have remarked before on how restrained the palette used in this show is. If the colorful kimonos of the girls in the screen cap above were placed unaltered into most recent anime, they would look dull and dreary. Yet by contrast, they are amongst the most colorful things displayed yet. The color designer, Miyoko Ichinose, was part of the team that worked with Tomomi Michizuki on such shows as Yokohama Kaidashi Kikou ~Quiet Country Cafe~ and Zettai Shonen. 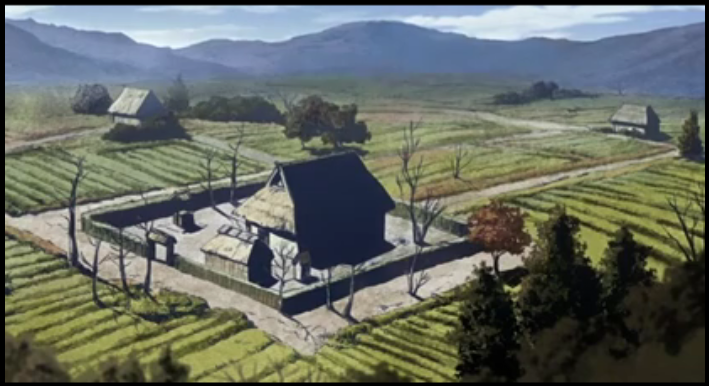 In fact, the opening sequence of this episode is one of the few scenes to have used high chroma colors. 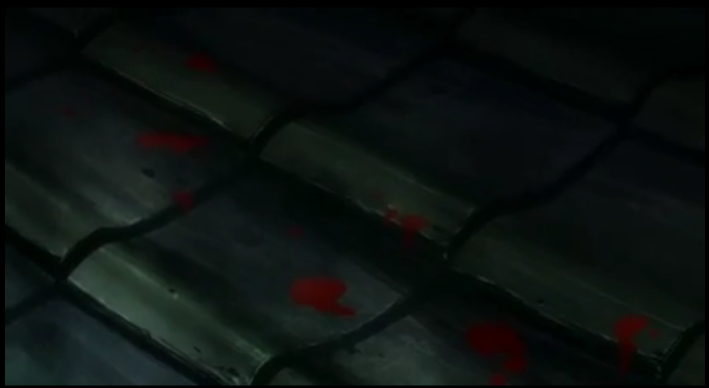 The red of the blood is uncharacteristically saturated, which lends impact to the scene. This colorful blood exposes a trail. Yaichi is generous, but he isn't open. 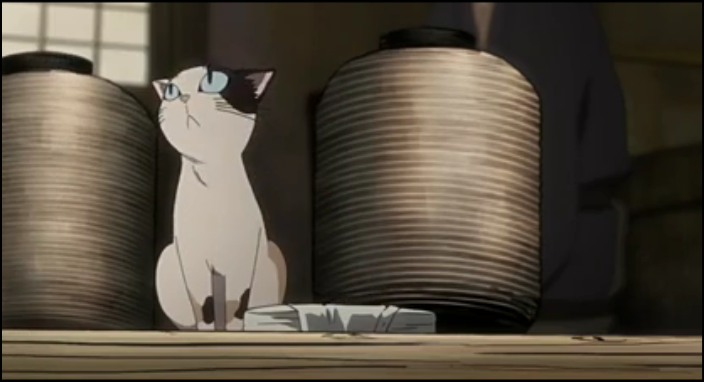 Masa continues to ask questions from and about Yaichi. 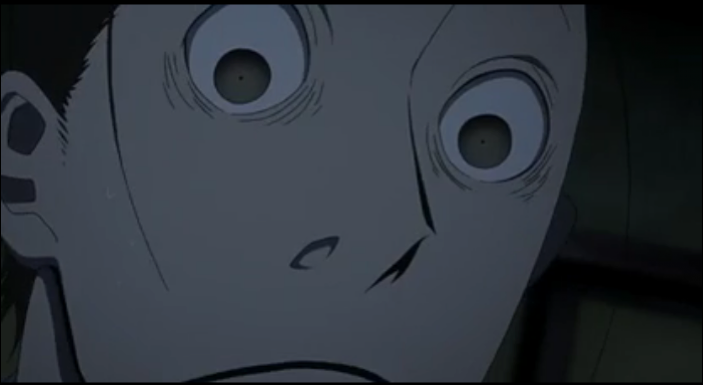 He gets very little information as a result, but manages to anger Yaichi in the process. 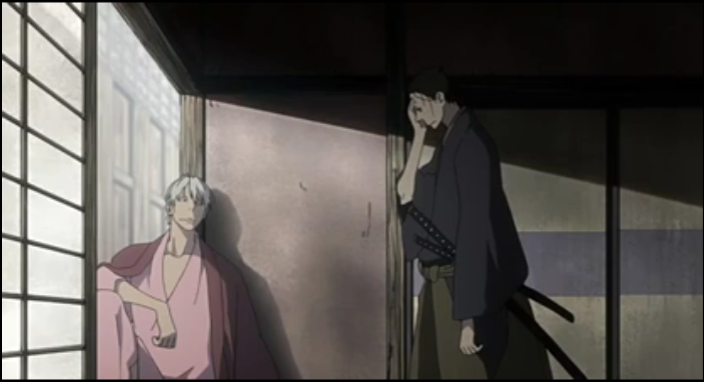 In one of the tensest moments in the episode, Yaichi invites Matsu to join him and Masa in his room. He then gets up and returns with tea for two people. Matsu seems freaked out that Yaichi would even say such a thing, so it isn’t too surprising that he doesn’t bother to stick around. 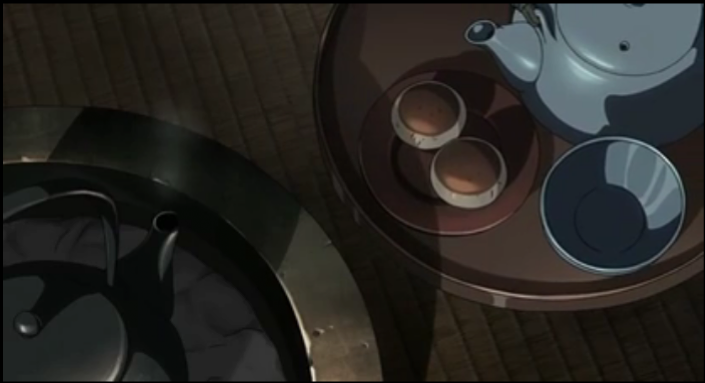 Masa characteristically doesn’t notice that Yaichi brought precisely enough food and cups for two people. This scene has some effective background music, and the actions are allowed to unfurl at their own pace, with very little dialogue. 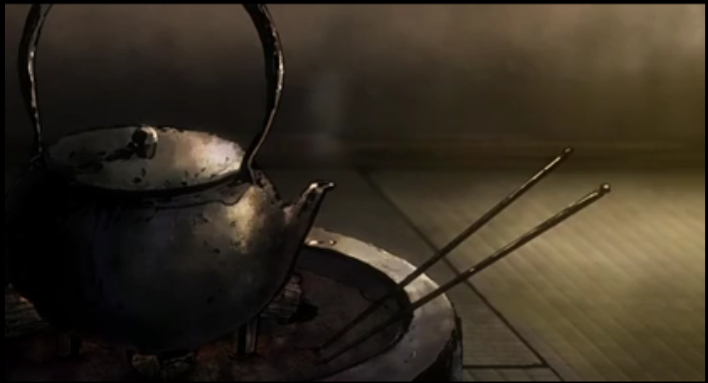 The tension was so high during this scene that, when Masa fell after having drank the tea, I wondered if Yaichi poisoned him.